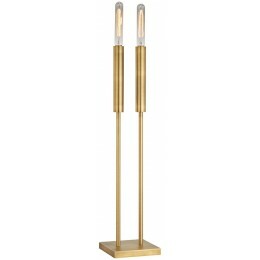 Perfectly capturing the timeless elegance, high glamour, and unbridled optimism of Machine Age design, the Godwin table lamp features two beacon-like Modern Art Deco silhouettes accentuated by a meticulously formulated antique brass finish. Adds stunning color and provocative lines to any design space. Vintage-style filament bulbs complete the look.